Barbara Brintnell was born in Prague, Czechoslovakia, and lived in Munich, Germany, throughout her school and university studies. She came to Canada in 1969 and has lived in Ottawa ever since. 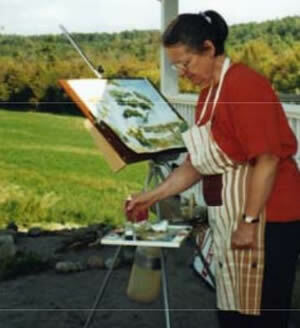 Barbara has been interested in photography, sketching and painting all her life, but only in 1993 when she retired from a management position at Bell Canada, she started to paint full-time. Barbara loves the challenges of watercolour as a spontaneous yet demanding medium; she prefers to paint both landscapes and flowers “en plein air”, an activity which combines well with her love of observing nature. In her studio she creates abstract and still life paintings and sketches done in watercolour pencils. Barbara is an elected Fellow of the Ottawa Watercolour Society, and currently Newsletter Editor of the East Central Ontario Art Association. She is an active member of Art Lending of Ottawa. Her work has been accepted in juried shows in Ottawa, Bancroft, Belleville, Haliburton, Etobicoke, Peterborough, and group exhibitions in the visitor center of Algonquin Park. Her paintings have been sold to homes in Ontario, Quebec, Germany, Austria, England, Scotland, Florida and California.